The most disruptive feature in Diablo III has nothing to do with hacking and slashing your way through the forces of hell: it's the game's real money auction house that lets players sell in-game items for real world cash. Now, after weeks of delay caused by security concerns and server stability issues, Blizzard has finally launched the Real Money auction house. After poking around at the game's economy for a few hours we've got a few pieces of advice to help you play smarter. Blizzard has wisely required all users of the Real Money Auction House to sign up with their two-step authentication service, which requires a stand-alone authenticator device or an app on your iOS/Android phone that's linked to your Battle.net account. With actual money on the line the impetus to hack accounts will be greater than ever and since no account with an authenticator has been successfully hacked requiring an authenticator seems like a solid strategy for keeping the market at least somewhat honest. 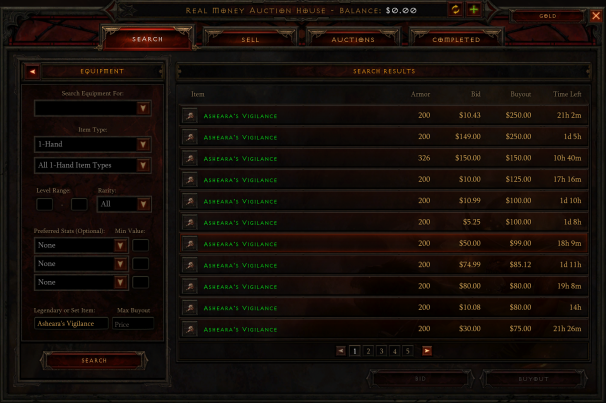 Once you've got your authenticator working, the real money auction house is remarkably simple to use. Just click on the button on the upper right side of the auction house window and you're working in US dollars (or pesos, euros or any of a half-dozen different currencies Blizzard currently supports) rather than in-game gold. Any money you make is automatically credited to your Battle.net account which you can use to pay for Blizzard products and subscriptions and it's relatively simple to hook your account up with a PayPal address to use the money for non-gaming purchases (though transferring your money to Paypal PayPal will take a further cut of your profits). At the moment Blizzard's Real Money Auction House isn't a great place for buying or selling your Diablo wares. Since the house has been open for less than a day items are selling at wildly divergent prices; it's easy to find duplicates of the same item with remarkably similar stats (Diablo randomizes not only item drops but the stats on those items as well, meaning even if a great weapon dropped for you there's probably a version with better stats available on the auction house) selling for the absolute maximum of $250 and for the bare minimum needed to make a profit (Blizzard takes a dollar from every sale, so it's impossible to sell an item for less than $1). Unfortunately the prices aren't likely to stabilize too quickly. The in-game gold auction house is still suffering from some pretty wonky pricing a month after launch. For now it's unlikely you'll manage to sell much of anything on the real money auction house, and you won't be able to tell if you're getting a good deal as a buyer. Worse, for now the auction house is only letting you sell equipment. Gems, blacksmithing plans, and other in-game items that have a consistent value every time they drop are considered "commodities" and Blizzard isn't letting you put these up for sale yet. Since every gem is basically identical they'll stabilize in price much more quickly and give an actual sense of how much anything is really worth in the Diablo universe. The best guess for the real value of anything comes (ironically) from the illegal gold and item sellers that will occasionally spam you in game. While I'd never advocate buying from a gold seller (what they do is illegal and involves some pretty deplorable labor practices), you can't argue that they don't have a fairly good grasp of the in-game economy. 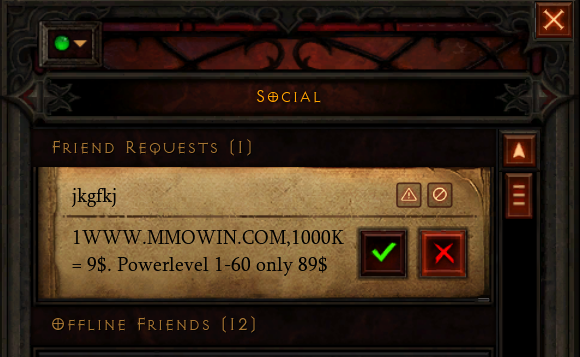 I logged in today to find a "friend request" from a gold seller offering a million gold for $9. That shakes out to about a dollar an hour for a level $60 character running through the game at the highest difficulty level. Not enough money to live off of, but perhaps enough for a regular Diablo III player to pay their monthly subscription to World of Warcraft.